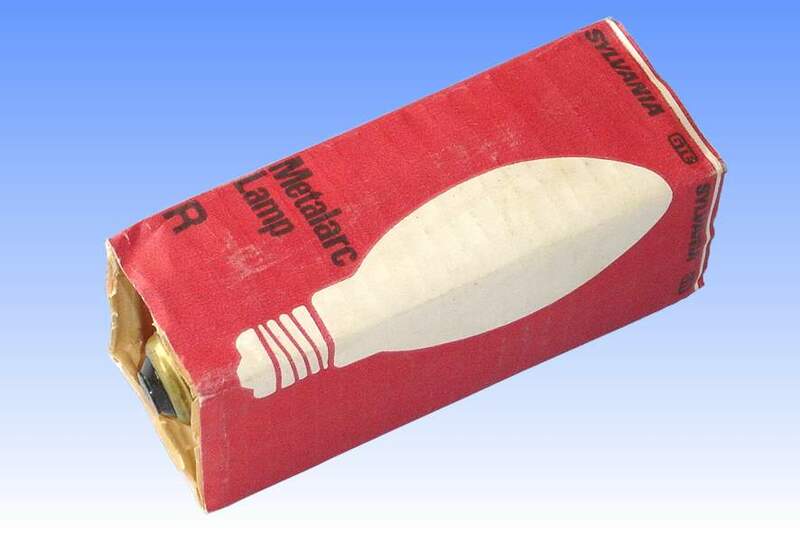 This is one of the first low wattage metal halide lamps for use in an open fixture. There is always a small chance that a metal halide arc tube will explode when it approaches end of life. 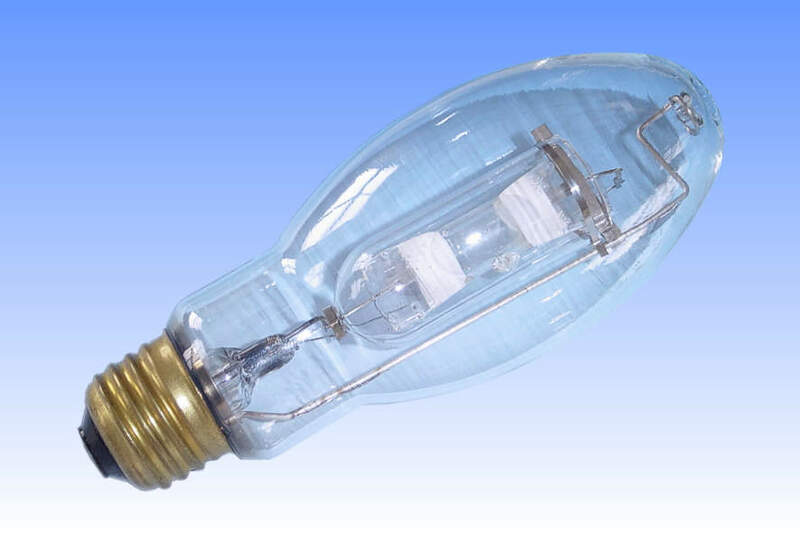 This is due partly to the corrosive effects of the metal halides on the quartz, and also to the fact that internal pressure tends to rise with lamp age, following blackening which raises temperature and internal pressure. If the arc tube explodes there is a risk that it will shatter the outer envelope, presenting a safety hazard. A range of open fixture lamps was thus developed by Sylvania, this lamp representing the first type. A heavy-walled quartz shroud provides the protection. It is made in a dome shape and is pierced with a small hole at one end, through which the arc tube lead wire passes. The other end is left open but this is acceptable. If the arc tube should explode, the shroud will absorb much of the energy of the flying arc tube fragments and protect the outer jacket from damage. The lamp is thus rendered suitable for use in open fixtures. It was curiously noted, however, that the colour stability through life was dramatically improved for shrouded lamps. This was found to be the case in mounting arrangements where the shroud is electrically floating, i.e. the metal straps which hold it are not connected to any current-carrying lamp components. It was discovered that due to photo-emission effects, the shroud acquires a small positive charge. If it is electrically floating, this charge cannot leak away. The positively charged shroud is most effective at repelling positively charged sodium ions that are present within the arc tube. They are kept away from the arc tube wall, and their rate of loss to the wall is slowed quite dramatically. References: 1) GTE Sylvania Europe Technical Manual for M75/M100/M150 Lamps 1989.